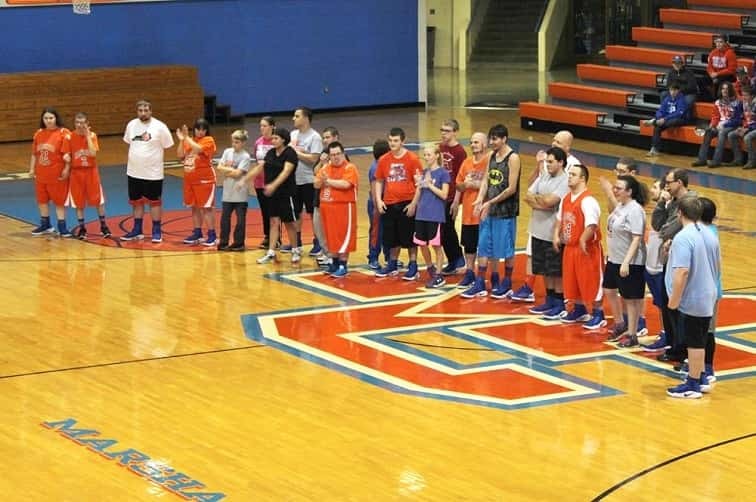 Marshall County Special Olympics basketball teams 1 and 2 during introduction at Meet the Marshals. Marshall County Special Olympic basketball teams hosted the 5th Annual Holiday Classic Tournament Saturday with games starting at 8:00 a.m. and continuing throughout the day until champions were crowned among the 20 teams in attendance. Hopkins County won the B Bracket championship 32-16 over runner-up Christian County, third place went to the Murray Rockets Green who beat Marshall I 18-16. The 1A Bracket champions were Owensboro Catholic 33-9 over runner-up Christian County.